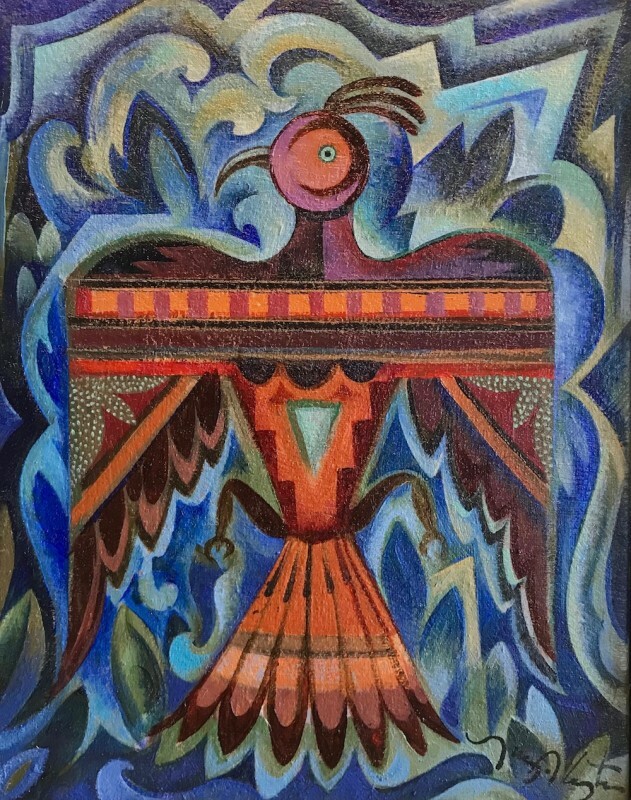 Join us during Heard Indian Market week for a new exhibition featuring work by Navajo artist Tony Abeyta. Tony will be joined by Mateo Romero (Cochiti Pueblo). 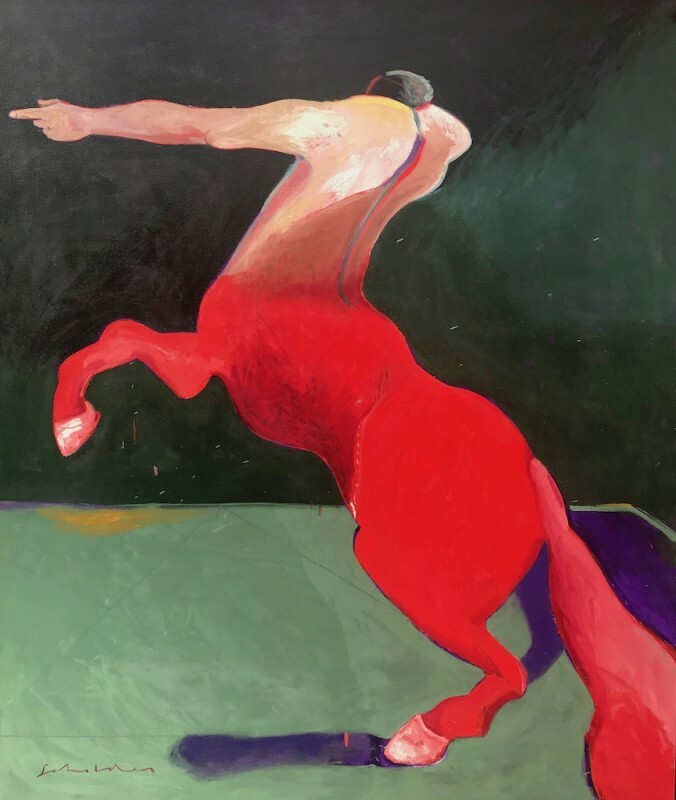 Also featuring works by the late artist Fritz Scholder (Luiseno, 1937-2005). 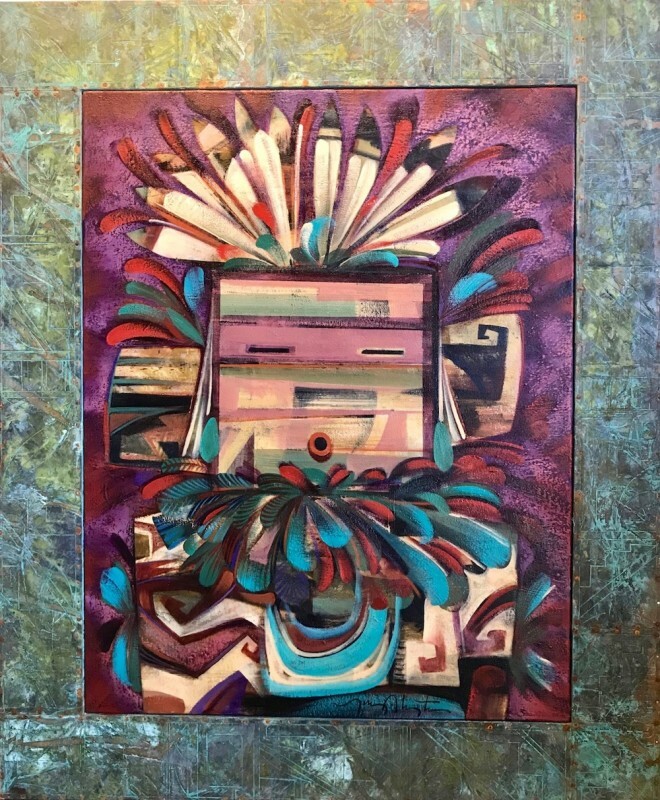 Meet Tony Abeyta and Mateo Romero at the show reception and Gold Palette Native ArtWalk Thursday, February 28 from 6:30-9pm. 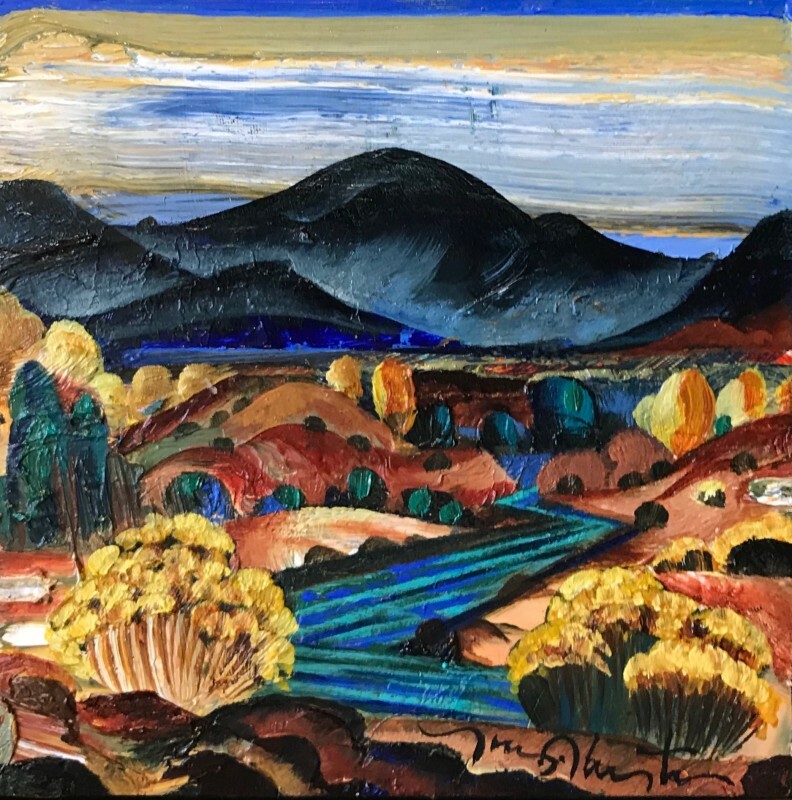 His current cohort finds him exploring wide terrain from modernist landscapes to abstractions—a place-inspired spectrum befitting an artist who splits his time between Santa Fe, New Mexico and Berkeley, California. The light characteristic of northern California has influenced many of the works at Altamira—a luminosity registered in the moments he pulls from memory. Abeyta lets place influence his paintings, rooting his practice in close observation and varied travel. His kinetic process translates into the diversity of his work, from the small paintings he produces on the road to the large canvases he labors over in his studio. Abeyta lets his paintings become what they will, free of his premeditation. So too he lets them coalesce into shows within the space of the gallery, only coming together in that context, resolved as singular scenes and collective concepts. Through lines surface, surprising even him. As such, his paintings encourage discovery by the audience and the artist alike. The presence of his paintings elicits everyone to be present. 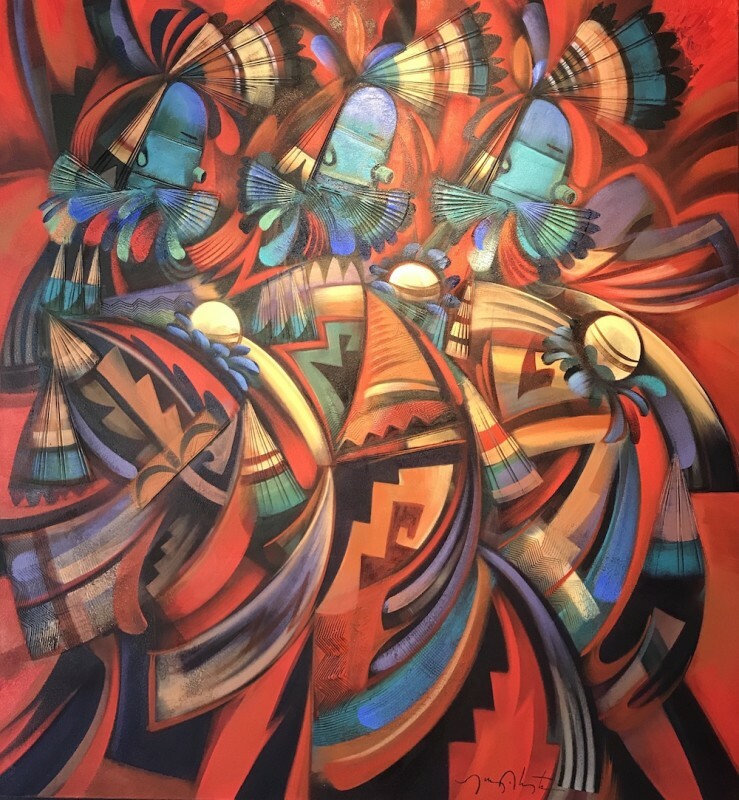 Contemporary Cochiti Pueblo painter Mateo Romero is an internationally known artist. He attended Dartmouth College and studied with acclaimed artists Ben Frank Moss and Varujan Boghosian. For more information call (480) 949-1256 or email az@altamiraart.com. Pre-sales available. Tony Abeyta is a Navajo contemporary artist working in mixed media paintings. He is a graduate of New York University with an honorary doctorate from the Institute of American Indian Arts in Santa Fe. He was the 2012 recipient of the New Mexico Governor’s Excellence in the Arts Award, and recognized as a Native treasure by the Museum of Indian Arts & Culture. Tony currently works in both Santa Fe, NM, and Berkeley, CA. 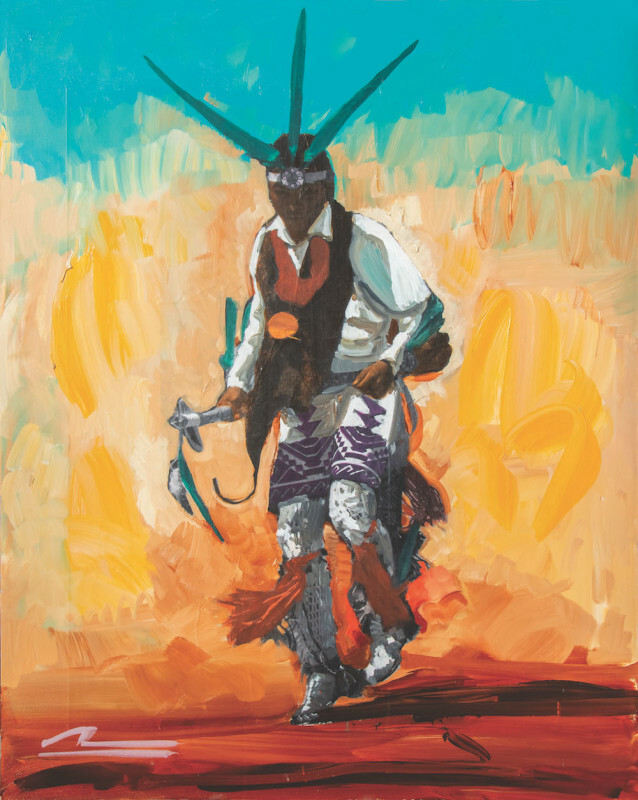 His work is included in the Smithsonian’s National Museum of the American Indian; Boston Fine Arts Museum; the Heard Museum in Phoenix, AZ; New Mexico Fine Arts Museum; the Autry Museum in Los Angeles; and the Eiteljorg Museum in Indianapolis; as well as in many other public and private collections. Recent exhibitions include the Masters of the American West Art Exhibition and Sale at the Autry Museum in Los Angeles, CA. Mateo Romero received an MFA in printmaking from the University of New Mexico. He is an award-winning artist who has exhibited internationally in Canada and the United States. 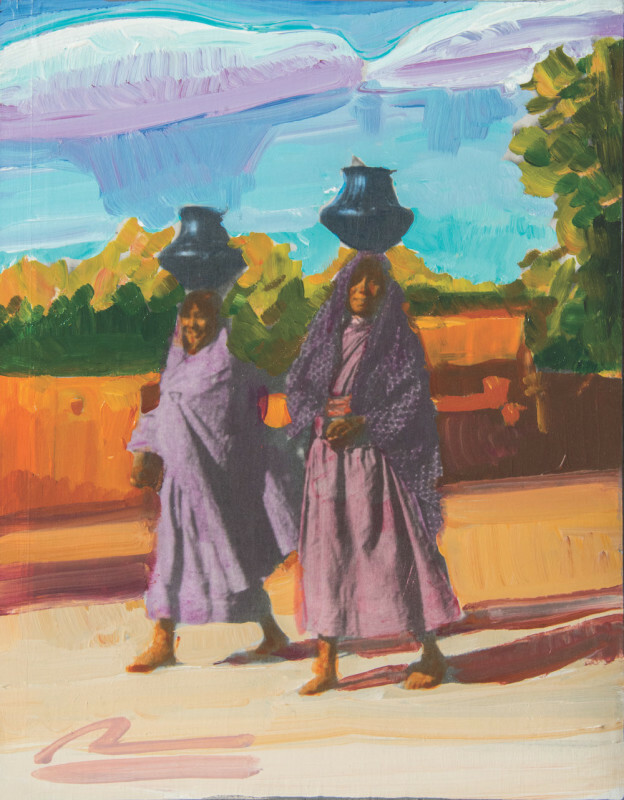 He is a former Dubin Fellow in painting at the School of American Research in Santa Fe, NM. 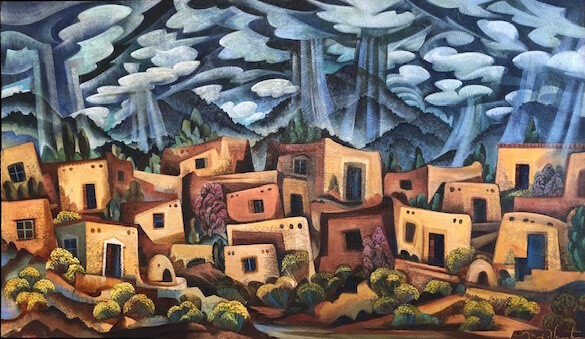 He paints in his studio in Santa Fe and lives in Pojoaque Pueblo with his wife, Melissa, and their children Erik, Povi, Rain and River. "As Native people we born into this world with an expectation that we will be participatory in life and contribute to society. What I have contributed most directly to life are my children and my art. Painting and drawing for me have always been urgent, compelling, and necessary. I make marks out of a need to communicate, to contextualize, to form meaning in the world around me. It is less of a choice and more of a manic drive deeply embedded in my psyche. Without these things, my life would be empty indeed." 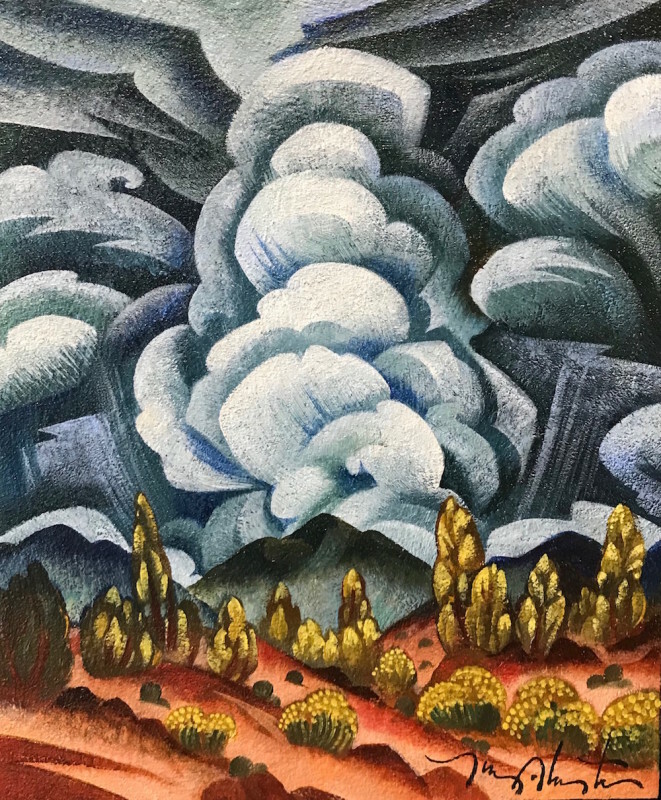 Recent exhibitions include the Coors Western Art Exhibit & Sale in Denver, CO, and the Masters of the American West Art Exhibition and Sale at the Autry Museum in Los Angeles, CA. 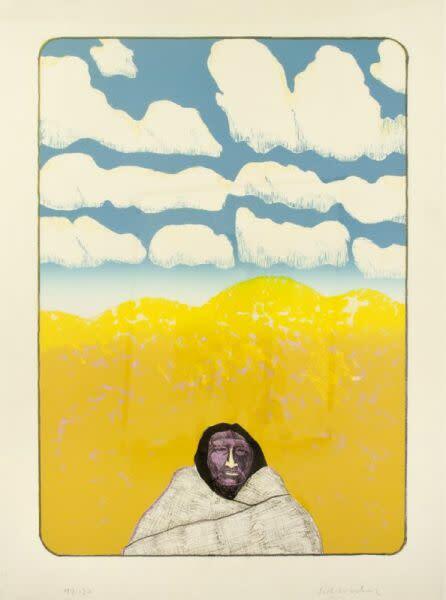 Fritz Scholder (1937-2005) was born in 1937 in Breckenridge, Minnesota. He was the fifth consecutive male of his family to bear this name. His paternal grandmother was a member of the Luiseño tribe of Mission Indians. 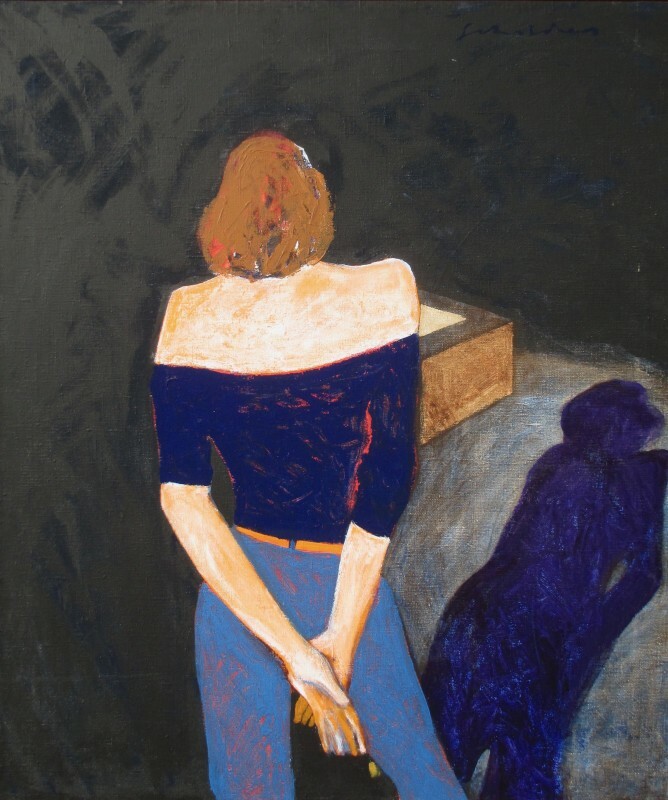 Scholder studied at the University of Kansas, Wisconsin State University, and with Wayne Thiebaud at Sacramento College in California. He earned a Master of Fine Arts Degree from the University of Arizona in 1964. Although Scholder did not consider himself an Indian, he was regarded as a leader of the New American Indian Art Movement. From 1964 to 1969 he taught painting and art history at the Institute of American Indian Arts in Santa Fe, New Mexico. 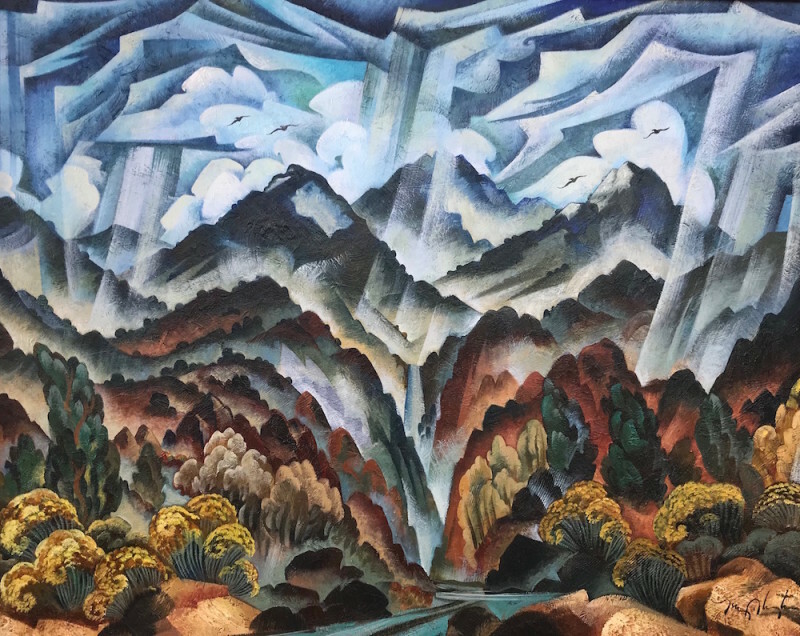 From the beginning, he struggled to represent the landscape and people of the Southwest without indulging in the romantic clichés of genre art on the Native themes. In time he created an extraordinary fusion of abstract expressionism, surrealism and Pop art to express his unique vision of the Southwestern scene and the Native experience. In his work, he frequently showed the harsh, realistic side of Indians' lives and deaths, including the affects of alcohol, but some of his depictions are humorous such as Indians on horseback carrying umbrellas. His brushwork is generally swift, and the tone often somber and surreal. A major influence on his work was the contemporary British artist, Francis Bacon, from whom Scholder adapted ironic distortions into his canvases. Although best known for his paintings, Mr. Scholder produced work in a variety of media - lithographs, photographs, sculpture and books. His work is in dozens of museum collections, including those of the Museum of Modern Art, the Los Angeles County Museum of Art, the Bibliothèque Nationale de France, the Hirschhorn Museum and Sculpture Garden, and the Smithsonian American Art Museum. Fritz Scholder died February 10, 2005 at age 67 in Scottsdale, and a memorial service was held at the Heard Museum in Phoenix. He was married to Lisa Markgraf Fisher and had one son. Call 480-949-1256 or email az@altamiraart.com for more information.